According to the Centers for Disease Control and Prevention (CDC), falls are the number one cause of death and injury for older adults. The CDC reports that one elderly adult falls down every second. The CDC recently released data for 2014 that indicated there were 29 million falls resulting in seven million injuries in the U.S. 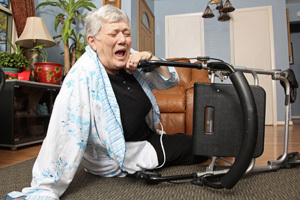 Approximately 27,000 older adults die because of falls or complications related to falls each year. If you believe a loved one recently fell due to nursing home abuse, contact our personal injury lawyers in Tulsa today. The CDC released this information to coincide with the 9th Annual Falls Prevention Awareness Day that took place on Sept. 22, 2016. The event is designed to raise awareness regarding falls for elderly individuals. The theme this year was: Ready, Steady, Balance: Prevent Falls in 2016. The number of injuries and deaths from falls is expected to significantly increase as 10,000 Americans turn 65 every day. Because so many people are affected by falls, the CDC and other government agencies are taking a special interest in creating and enforcing measures to prevent them. They are recommending that fall prevention activities become a part of elderly American’s standard routines. Physicians should encourage seniors to take part in these kinds of activities. They should also specifically ask patients if they have fallen in the past year, if they think that they are unsteady or if they are worried about falling. Seniors may also want to increase Vitamin D supplements if they are concerned about brittle bones and joints. If your elderly loved one was injured in a slip-and-fall accident at a nursing home, he or she may be able to recover compensation. Nursing homes have a legal obligation to maintain a safe environment for residents, and when they do not they can be held accountable. The nursing home abuse attorneys at The Edwards Law Firm will review your claim for free and inform you of all of your legal options. Contact us today to get started.